Does anyone else still struggle to figure out what life is supposed to look like? I personally have no clue. Factor in the fact that, somehow, in some way, Christ is meant to be at the center of it all, and I find myself floundering even when it comes down to deciding what to do with my life. Should I be an organizational communication consultant? A musician? A mother and homemaker? A professional gift wrapper (still holding out for this one to be remotely possible)? A writer? An artist? A seamstress? All of the above (laugh all you want, but I do try to make it all work in my head sometimes)? By now, I do know that I can’t have it all. On my best days, two of the above seem improbable, if not impossible. Perhaps I have too many interests or perhaps I think I do just so that I can avoid making a decision as to what to do with my time and energy and talents. Perhaps I’m just scared that what I have to offer the world isn’t good enough. Really scared. But there’s the crux of the whole issue right there, isn’t it? I’m not good enough. I’ve spent a lifetime trying to skirt by on my own virtues and successes, in spite of the fact that it is God’s supreme sovereignty and grace that has gifted me with everything that I have and am. 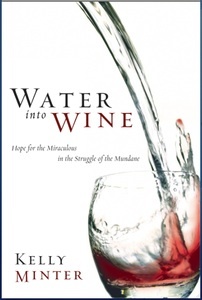 Currently, I’m finding my way through Water into Wine: Hope for the Miraculous in the Struggle of the Mundane by Kelly Minter. 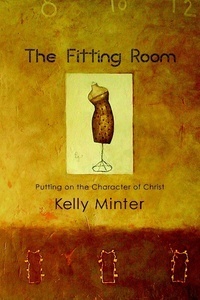 She is quickly becoming one of my favorite authors, for many reasons, but this particular book concerns the miracle of Jesus turning water into wine at the wedding in Cana (from John 2). One of the most indelible things she has hit thus far has been the perspective of the servants. Her point is that they likely served guests and their masters day after day, year after year, with little variation in the routine – until Jesus showed up and asked them to draw water, which they drew and, somehow in the transfer, it became the best of wines. What is it all for? Another day of work, another day of showing up, another concert, another wedding, another stone jar of water, another order from yet another person: “Fill the jars with water… Take them to the master of the banquet.” The servants had probably been doing this for years. Feast after feast, they served people who were wealthier and higher in status. It was the same rote activity with no shadow of turning. Day after day. Water in… water out. Routine. Predictable. Monotonous. Mundane. Regimented. What in the world is it all for? I don’t think I’m stretching things by suggesting that this may have been the servants’ dilemma, because it seems to me that this is everyone’s dilemma: We all go ’round and ’round, attempting to make life work just so we can get up the next day to make it work again. Whether we act on Broadway or deliver newspapers for a living, life doesn’t seem to make much sense or have much value without the conviction that God is divinely involved, able and eager to reach down at any moment and turn the everyday stuff of life into something divine, something that counts for eternity, something that is beyond ourselves. Beyond myself. I so rarely think in those terms. It’s either “I can do this” or “I can’t.” There doesn’t seem to be a fuzzy gray area in between where I discover that “I can’t, but God can.” I’m not bringing Him my water jars “filled to the brim” and expecting Him to do something bewilderingly amazing with them – such as turning them into wine. I find every excuse not to fill my water jars. At all. I complain about the water being the wrong temperature, requiring a filter, or splashing all over what I’m wearing – I don’t simply obey in offering all that I am and all that God made me to be (which is the same thing, really) for Him to use. Not every day will be extraordinary. The servants at Cana likely waited a really long time before that one incredible day that Jesus was there. But I need to expect that God both can and will provide in miraculous ways for my life here and there. I need to expect that He can and will divinely speak into my life about what it should look like, where I should work, how I should serve those that I love (and some that I struggle to), and when to simply rest. So this is what being grown-up feels like, huh? Still working to fork over to God the things that are already rightfully His… and praying that I might occasionally, by His grace, be able to do so. Excerpt from Water into Wine: Hope for the Miraculous in the Struggle of the Mundane by Kelly Minter. 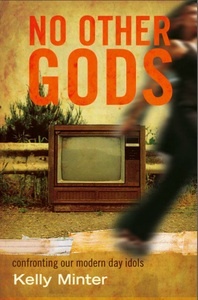 Minter also wrote No Other Gods: Confronting our Modern Day Idols, which I read earlier this year and which was an instrument God used to reveal idolatry that had/has made a home in my own heart; and The Fitting Room: Putting on the Character of Christ, which just came out in April and which I will be starting as soon as I finish Water into Wine. Like I said, one of my newest favorite authors. See kellyminter.com for more.